President Maithripala Sirisena planted a Na tree in the garden of the official residence of the British High Commissioner (Westminster House). The event was to mark President Sirisena’s last week as Commonwealth Chair-in-Office before he departs for CHOGM 2015 in Malta. President Sirisena and High Commissioner James Dauris met to discuss this week’s Commonwealth Heads of Government Meeting (CHOGM) in Malta, the UN Climate Change Conference (COP21) and other issues including Sri Lanka’s progress in implementing the recommendations of the UN Resolution. 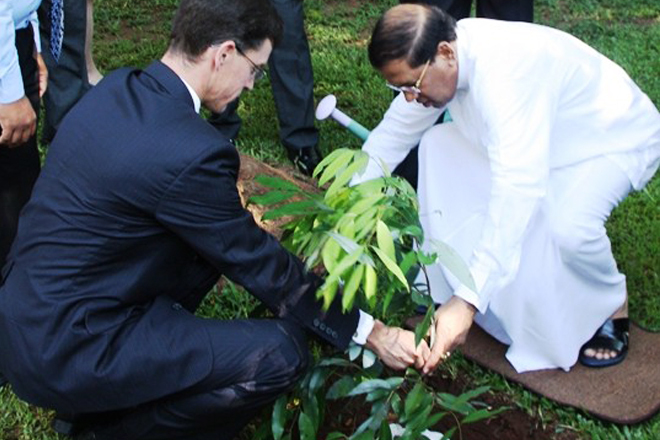 In addition to reflecting Sri Lanka and the UK’s longstanding partnership in the Commonwealth, it also symbolises the two countries’ commitment to green values. Under the Green is GREAT campaign, the UK Foreign and Commonwealth Office seeks to further a globally beneficial environmental agenda. Some of the key tenets of the global environmental agenda will be discussed at the upcoming UN Climate Change Conference (COP21) on November 30th. COP21 will discuss action to reduce global emissions, along with carbon pricing, reducing deforestation, clean energy innovation, green finance and green free trade. In September this year the UK made commitments to significantly increase climate finance over the next five years, providing at least £5.8 billion ($9 billion). This is on top of the £3.87billion ($6 billion) the UK has already committed from 2011 to 2016. By 2020 the UK’s annual climate financing will be double that of 2014. The UK is committed to playing its part to meet the goal of jointly mobilising $100 billion of public and private finance by 2020.